512-478-1915 | Locations | FREE Consultation! Vitamin C fatty acid esters and Vitamin C sulphonates have been used in cosmetics for the purpose of preventing pigmentation. These compounds, however, are unstable when formulated into water-miscible cosmetic creams and considerable discoloration of the products as well as decrease in the vitamin C content occurs with lapse of time. C-MATE is a vitamin C derivative that is more stable in cosmetics. C-MATE is extremely stable in cosmetic bases compared with vitamin C.
C-MATE is well absorbed through the skin. C-MATE is converted into vitamin C in the skin and exerts vitamin C activity. C-MATE is safe to use. C-MATE is a white to yellowish-white powder. C-MATE is a soluble in water but insoluble in organic solvents. C-MATE has no reducing action so that is hardly oxidized. C-MATE is dephosphorylated into free vitamin C in an acidic solution or in the presence of phosphatase. 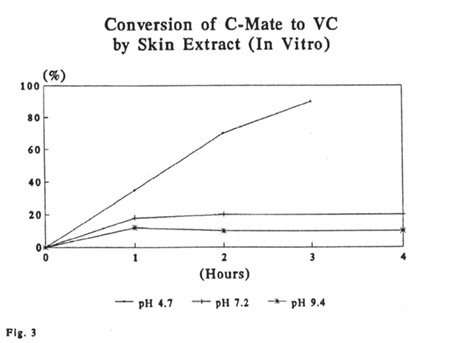 C-MATE is extremely stable in cosmetic bases compared with ordinary vitamin C.
The stability of C-MATE was examined by mixing C-MATE at a rate of 3% with these two ointment bases. Three- percent creams containing C-MATE, vitamin C stearate and vitamin C, respectively, were prepared. The samples were left standing on a glass pane at room temperature and the rate of breakdown was determined 10-30 days later. C-MATE cream was extremely stable, while the vitamin C cream was unsuitable, as the major part of vitamin C had been decomposed in 10 days. Vitamin C stearate was found to rank between C-MATE and vitamin C.
Observation was also carried out on the appearance of cosmetics containing C-MATE. It was found that discoloration and foaming (due to carbon dioxide gas forming as a result of vitamin C breakdown) scarcely developed even when the sample was stored at room temperature for more than 1 year. Table 1 shows variations in the quality of creams (o/w type) containing 3% as vitamin C or C-MATE filled into tubes and stored at room temperature and 40 C. It is clear that C-MATE is extremely stable. Healthy human subjects were given a prescribed diet and prohibited from excessive vitamin C intake. The urinary output of vitamin C was determined every 2 hours thereafter. 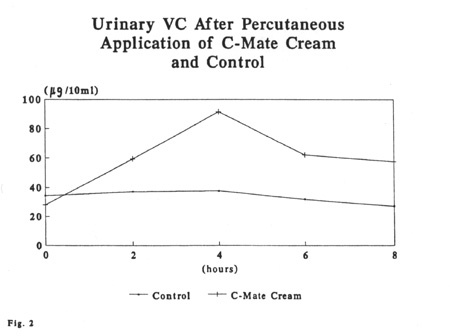 Figure 2 shows that the urinary output of vitamin C in the C-MATE group was 2-3 times higher than that of the control. The findings suggest that C-MATE is percutaneously absorbed by human skin and is converted into vitamin C in the skin tissue or other organs. As a result, the urinary output of vitamin C increases. C-MATE is converted into vitamin C in the skin and exhibits vitamin C activity. A skin extract was used. To 10 ml of the extract was added 1 mg of C-MATE. After incubation at 37 C, the vitamin C formed was quantitatively assayed. Figure 3 shows that 70-90% of C-MATE was converted into vitamin C under an optimal condition (pH 4 – 5). The conversion of C-MATE into vitamin C decreases a pH above 7.0 and this dephosphorylation is due to acid phosphatase activity in the skin. 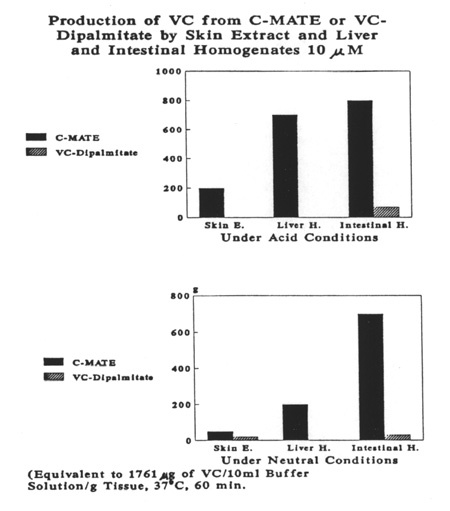 A similar experiment was undertaken on C-MATE, comparing it against vitamin C dipalmitate. Under acid conditions, the amount of vitamin C formed from C-MATE was 30 times more than that from vitamin C dipalmitate in the skin, 300 times more in the liver, and 15 times more in the intestine. Under neutral conditions, it was 3 times, 40 times and 20 times more in the skin, liver and intestine, respectively.